Detroit enjoyed a 24-10 win at MetLife Stadium on Monday. ODELL BECKHAM JR returned but he was unable to prevent the New York Giants from suffering a 24-10 loss to the Detroit Lions in the NFL. Both teams and their respective offensive lines struggled during the clash at MetLife Stadium on Monday as Giants star Beckham made his return from an ankle injury. Detroit’s Greg Robinson was penalised three times, with two accepted penalties, and was a big reason Lions quarterback Matthew Stafford was under constant pressure. Stafford was sacked just twice, thanks to his mobility, but Robinson especially struggled against Giants defensive end Olivier Vernon, who had five tackles. Stafford lost a fumble on one sack and finished with 122 passing yards and two touchdowns on 15-of-21 passing. As much trouble as Robinson had with the Giants defensive front, he looked like a Pro Bowler compared to Ereck Flowers. Lions pass rusher Ezekiel Ansah ran through Flowers like he was a turnstile en route to three sacks. Detroit dropped Giants quarterback Eli Manning five times and hit him an additional eight times with just a four-man rush. Manning turned in a game effort by going 22 of 32 for 239 yards with a touchdown and interception. Email “Beckham makes his return but Giants offense struggles as Lions coast to victory”. 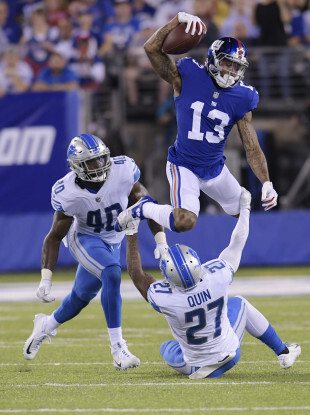 Feedback on “Beckham makes his return but Giants offense struggles as Lions coast to victory”.